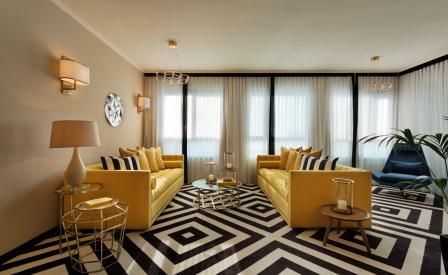 Leon Avigad and Nitzan Perry of Tel Aviv-based hospitality group Leopard, have launched a sister property to the city’s much-loved cultural landmark, the Brown TLV Hotel. This time located along the re-developed coastline, among some of Tel Aviv’s most anticipated architectural projects, the Brown Beach House is a welcome boutique offering, challenging the area’s somewhat staid hotel chains. Dressed by local outfit, vstudio and designer Aline Langlieb, the interiors are a distinct blend of retro resort and hip urbanism, with swathes of plush Carrera marble and slick brass details in the 40 guestrooms and cane and vintage furniture in the public spaces downstairs. After a day spent in the on-site spa or soaking up the sun on your room’s private terrace, head down to the restaurant for some fresh fish from the Med and homegrown wine or while the night away in the Flamingo Bar- already a neighbourhood hotspot for live music, pop-up events and visual art parties.